This old sow visits your town every Sunday morning in Animal Crossing: New Leaf. 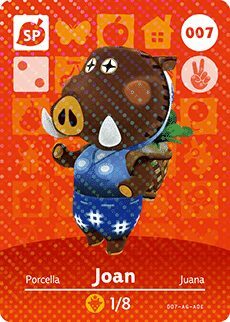 Players can find Joan wandering around outdoors, peddling her trademark turnips. These rare root vegetables can only be bought from Joan while she’s in town on Sundays, to then be sold to Re-Tail the following week as soon as the turnip prices spike. Her birthday falls on January 8th, meaning that her star sign is Capricorn.